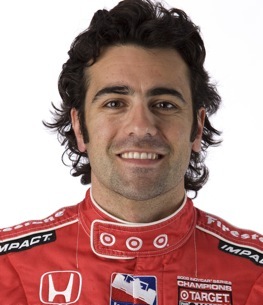 Dario Franchitti wins in Long Beach. Long Beach, Calif. – Even for a road racer, Dario Franchitti took a circuitous route to find victory lane in the streets of Long Beach. Driving for Target Chip Ganassi Racing, the Scotsman scored his first victory since his gambit to drive stock cars for Ganassi in NASCAR ended abruptly last summer. Unable to locate backing for Franchitti, Ganassi pulled the plug on the sponsor-me-white Dodges in NASCAR. When the seat opened up at the IndyCar team after Dan Wheldon left in a contract dispute at the end of 2008, that paved the way for the Scotsman’s return to open-wheel racing. At the Toyota Grand Prix of Long Beach, Franchitti was in the right place at the right time. Twice his team called him into the pits just prior to yellows, putting his Dallara-Honda into the front when the other leaders came down the pit road from behind the safety car. The Scotsman, who started second, had the pace as well to stay ahead of pole winner Will Power’s Penske Racing Dallara-Honda, finishing 3.3182 seconds ahead at the checkers. “I had a couple more seconds in the car if I needed it,” said Franchitti, who worked on saving fuel throughout the race but also turned the fastest race lap by a leader. Ironically, Franchitti finished as a runner-up twice at Long Beach to Ganassi entries. “I remember following the rear wing of the Ganassi cars here,” he said, referring to victories by Alex Zanardi in 1998 and Juan Pablo Montoya in 1999. Power’s tumultuous weekend continued Sunday in the No. 12 entry hastily pulled out for him when Helio Castroneves returned after acquittal in his tax evasion trial to drive Penske’s No. 3 entry. Electrical problems kept Power stalled on the pit road prior to the parade laps and his radio failed to work in the race, forcing him to rely on the pit board. Fourth-placed Danica Patrick made one slight excuse over missing the podium, saying it might have been different save for the blend line at the pit exit, where Andretti Green Racing teammate Tony Kanaan got by for third prior to the final green segment. “I’m just happy to go from 22nd to fourth,” said Patrick, who spun on cold tires in qualifying. Like Kanaan, Patrick relied on some changes to her Dallara after qualifying to improve on a miserable qualifying day for the AGR team.